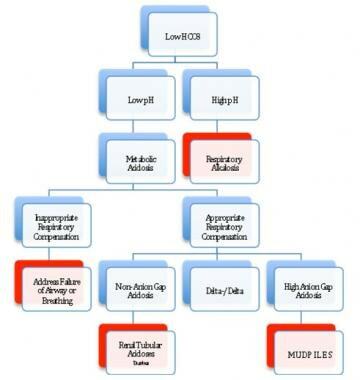 The image below depicts a flowchart for evaluating metabolic acidosis. Go to Metabolic Acidosis in Emergency Medicine and Metabolic Acidosis for complete information on these topics. A primary metabolic acidosis is a pathophysiologic state characterized by an arterial pH of less than 7.35 in the absence of an elevated PaCO2. It is created by 1 of 3 mechanisms: (1) increased production of acids, (2) decreased excretion of acids, or (3) loss of alkali. If the measured PaCO2 is higher than the expected PaCO2, a concomitant respiratory acidosis is also present. The development of normocapnia or hypercapnia when a severe metabolic acidosis is present often signals respiratory muscle fatigue, impending respiratory failure, and the possible need for initiating mechanical ventilation. The kidneys are responsible for reclaiming filtered bicarbonate (HCO3-) and eliminating the daily acid load generated from nitrogen (protein) metabolism. Normally, the kidneys excrete hydrogen ions (H+) through the formation of titratable acids and ammonium. The ability of the kidney to excrete an increased acid load generally begins 12-24 hours after the compensatory hyperventilation begins and continues for 1-3 days. Over time, the kidneys attempt to increase reabsorption of HCO3- to compensate for the acidosis. The severity of the acidosis depends on the rapidity of bicarbonate loss and the ability of the kidney to replenish bicarbonate. To achieve electrochemical balance, ionic elements in the extracellular fluid must equal a net charge of zero. Therefore, the number of negatively charged ions (anions) should equal the number of positively charged ions (cations). Measured serum anions are chloride and bicarbonate, and the unmeasured anions include phosphates, sulfates, and proteins (eg, albumin). The primary measured serum cation is sodium, but other cations are noted, such as calcium, potassium, and magnesium. Practically, a metabolic acidosis is divided into processes that are associated with a normal anion gap (8-12 mEq/L) or an elevated anion gap (>12 mEq/L). A normal anion gap metabolic acidosis involves no gain of unmeasured anions; however, because of the need for electrical neutrality, serum chloride replaces the depleted bicarbonate, and hyperchloremia develops. In contrast, an elevated anion gap metabolic acidosis is caused when extra unmeasured anions are added to the blood. The clinical manifestations of a metabolic acidosis are related to the degree of acidemia. Initially, patients with a metabolic acidosis develop a compensatory tachypnea and hyperpnea; if the acidemia is severe, the child can present with significant work of breathing and distress. An increase in serum hydrogen ion concentration results in pulmonary vasoconstriction, which raises pulmonary artery pressure and pulmonary vascular resistance. An increase in right ventricular afterload and, potentially, right ventricular dysfunction can then occur. This is especially problematic in newborn infants with persistent pulmonary hypertension. Tachycardia is the most common cardiovascular effect seen with a mild metabolic acidosis. As the serum pH continues to fall below 7.2, myocardial depression occurs because hydrogen ions act as a negative inotrope and peripheral vasodilation occurs. Also, with acidemia, cardiovascular response to endogenous and exogenous catecholamines can decrease, which can possibly exacerbate hypotension in children with volume depletion or shock. Central nervous system (CNS) manifestations can include headache, lethargy, confusion, or any change in mental status secondary to a decrease in intracerebral pH. Cerebral vasodilation occurs as a result of a metabolic acidosis and may contribute to an increase in intracranial pressure. Acidosis shifts the oxygen-hemoglobin dissociation curve to the right, decreasing hemoglobin’s affinity for oxygen and thus promoting release into body tissues. During a metabolic acidosis, excess hydrogen ions move toward the intracellular compartment and potassium moves out of the cell into the extracellular space (serum). For every decrease in the serum pH by 0.1, a concomitant increase in the serum potassium level by 0.5 mEq occurs. As a result, hyperkalemic arrhythmias (peaked T waves and QRS widening) and ventricular fibrillation may occur. Other acute metabolic effects of acidemia include insulin resistance, increased protein degradation, and reduced adenosine triphosphate (ATP) synthesis. During acidemia, the oxyhemoglobin dissociation curve shifts to the right; oxygen has a lower affinity for hemoglobin, but hemoglobin more readily releases oxygen. Also, nonspecific GI complaints, such as abdominal pain, nausea, or vomiting, may be present. The causes of a metabolic acidosis can be classified on the basis of a normal or elevated anion gap. Infants are more likely to develop a normal anion gap metabolic acidosis secondary to significant losses of bicarbonate in diarrheal stools. The stool output can contain as much as 70-80 mEq/L of bicarbonate. Patients with an ureterosigmoidostomy may lose bicarbonate in exchange for the reabsorption of chloride and ammonium as urine accumulates in the sigmoid colon. Children with congenital or acquired renal tubular acidosis can lose large amounts of bicarbonate, with or without concomitant potassium loss. Inborn errors of metabolism may result in a metabolic acidosis, with or without hypoglycemia or hyperammonemia. Hydrogen ions generated by the hydrolysis of ATP convert lactate to lactic acid. Under normal conditions, the liver rapidly converts these small amounts of lactic acid to pyruvic acid, which is then metabolized to carbon dioxide and water. Under conditions of oxygen deprivation and decreased oxygen delivery to the tissues, anaerobic metabolism produces excessive amounts of lactic acid. Most disease processes that result in decreased oxygen delivery also frequently lead to diminished hepatic function, further compounding lactic acid accumulation. Conditions that frequently lead to lactic acidosis include shock, sepsis, thiamine deficiency, diabetic ketoacidosis, and cellular poisoning (eg, cyanide toxicity). Metabolic acidosis is a biochemical derangement occurring as part of certain disease states and conditions. No statistics are available on its frequency. No race predilection is noted in metabolic acidosis, and the prevalence rates for the condition are equal in males and females. Metabolic acidosis can occur in any age group. Patient outcome depends on the nature of the disease process that led to metabolic acidosis. Children with an inherited metabolic disease require long-term, specialized management and a special diet. Those with diabetic ketoacidosis need lifelong insulin administration and an appropriate diet. Patients who develop a metabolic acidosis secondary to a toxic ingestion or poisoning have the potential to recover without long-standing consequences. Untreated severe metabolic acidosis may be associated with life-threatening arrhythmias, myocardial depression, and respiratory muscle fatigue but is not generally the ultimate cause of morbidity and mortality. Kraut JA, Madias NE. Metabolic acidosis: pathophysiology, diagnosis and management. Nat Rev Nephrol. 2010 May. 6(5):274-85. [Medline]. Hodson E. Metabolic acidosis and growth in children. Nephrology. Dec 2005. 10(S5):S221-2. [Full Text]. Randolph DA, Nolen TL, Ambalavanan N, Carlo WA, Peralta-Carcelen M, Das A, et al. Outcomes of extremely low birthweight infants with acidosis at birth. Arch Dis Child Fetal Neonatal Ed. 2014 Feb 19. [Medline]. Dabelea D, Rewers A, Stafford JM, et al. Trends in the prevalence of ketoacidosis at diabetes diagnosis: the SEARCH for diabetes in youth study. Pediatrics. 2014 Apr. 133(4):e938-45. [Medline]. [Full Text]. Nallasamy K, Jayashree M, Singhi S, et al. Low-dose vs standard-dose insulin in pediatric diabetic ketoacidosis: a randomized clinical trial. JAMA Pediatr. 2014 Nov. 168(11):999-1005. [Medline]. Koves IH, Leu MG, Spencer S, et al. Improving care for pediatric diabetic ketoacidosis. Pediatrics. 2014 Sep. 134(3):e848-56. [Medline]. Han JJ, Yim HE, Lee JH, Kim YK, Jang GY, Choi BM, et al. Albumin versus normal saline for dehydrated term infants with metabolic acidosis due to acute diarrhea. J Perinatol. 2009 Jun. 29(6):444-7. [Medline]. Forsythe SM, Schmidt GA. Sodium bicarbonate for the treatment of lactic acidosis. Chest. 2000 Jan. 117(1):260-7. [Medline]. Manthous CA. Lactic acidosis in status asthmaticus : three cases and review of the literature. Chest. 2001 May. 119(5):1599-602. [Medline]. Parker MJ, Parshuram CS. Sodium bicarbonate use in shock and cardiac arrest: attitudes of pediatric acute care physicians. Crit Care Med. 2013 Sep. 41(9):2188-95. [Medline]. Agarwal B, Kovari F, Saha R, Shaw S, Davenport A. Do Bicarbonate-Based Solutions for Continuous Renal Replacement Therapy Offer Better Control of Metabolic Acidosis than Lactate-Containing Fluids. Nephron Clin Pract. 2011 Feb 23. 118(4):c392-c398. [Medline].